A rainbow of fresh vibrant colours, fragrance and flavours. 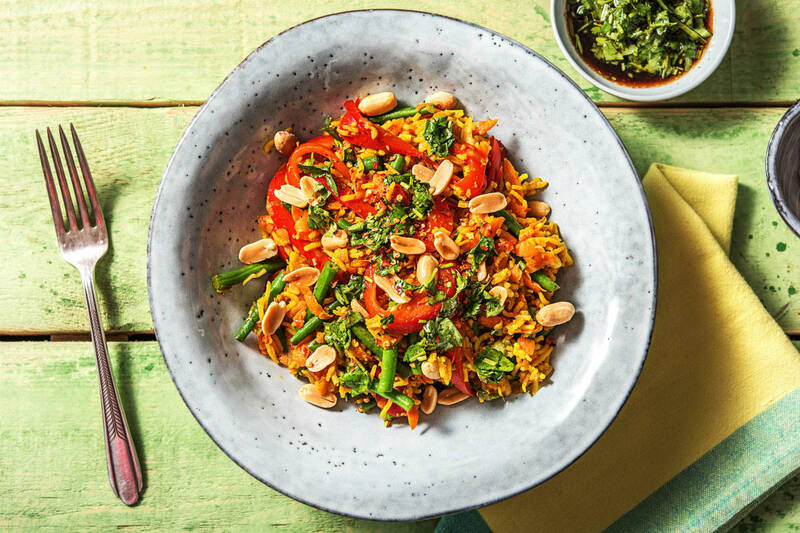 Fluffy rice, green beans, red peppers and carrots made spicy with chilli flakes, ginger and lime zest and balanced with sweet ketjap manis and topped with coriander, peanuts and soy sauce. A vegetarian feast. 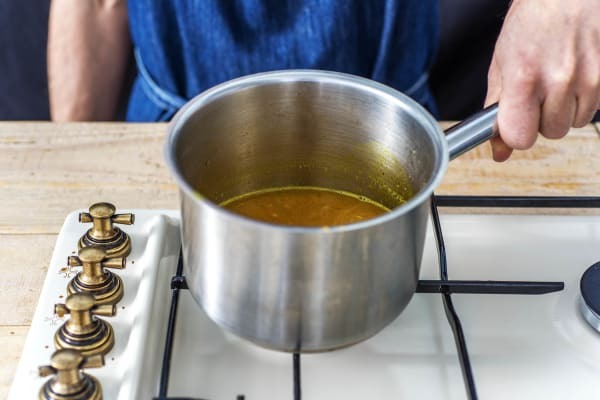 Pour the water (see ingredients for amount) into a large saucepan over high heat. Stir in the stock powder and add the basmati rice and turmeric. Stir and bring to the boil, Lower the heat to medium and pop a lid on the pan. Cook for 10 mins, then remove from the heat and set aside (still covered) for another 10 mins or until ready to serve. 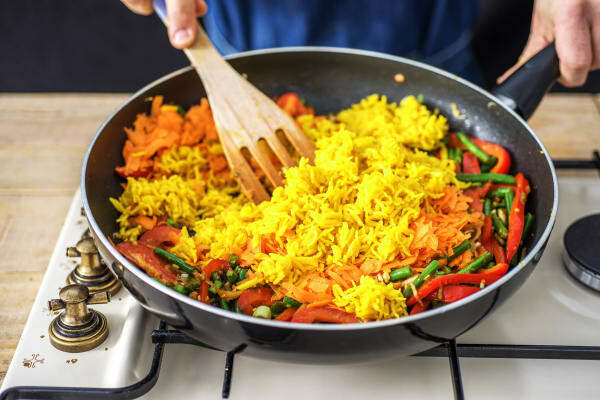 TIP:The rice will finish cooking in its own steam. While the rice is cooking, trim the stalky tops from the green beans and chop them into three pieces. Halve, then remove the core from the pepper and thinly slice. Top and tail the carrot then grate on a coarse grater (no need to peel). Peel and finely grate the ginger. Remove the root and thinly slice the spring onion. Roughly chop the coriander (stalks and all). Zest the lime then cut in half. Heat a drizzle of oil in a large frying pan over a medium high heat. 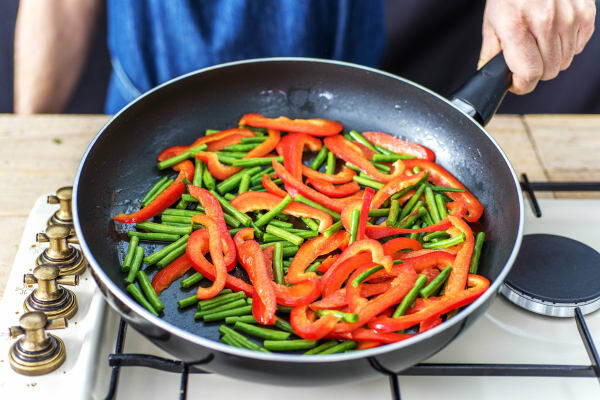 Once hot, add the green beans and red pepper. 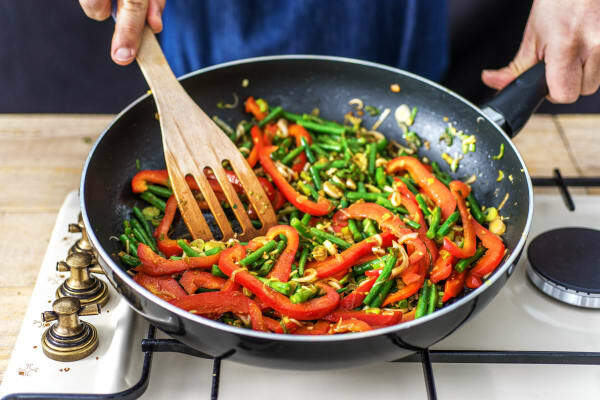 Stir-fry for 5-6 mins or until the pepper is softened and the beans are slightly charred. Add the spring onion, ginger, lime zest, and a tiny pinch of chilli flakes (you can add more later if you want to ramp up the heat!) into the pan. Stir together and cook for 1 minute, then pour in the ketjap manis and half the soy sauce. Stir together and cook for 2 minutes, then remove from the heat. Fluff up the rice with a fork and stir it into the veggie mixture along with the grated carrot. Serve in bowls with the herby drizzle on top and a sprinkling of sesame seeds. Scatter some chilli flakes on top if you like things extra spicy! Enjoy!